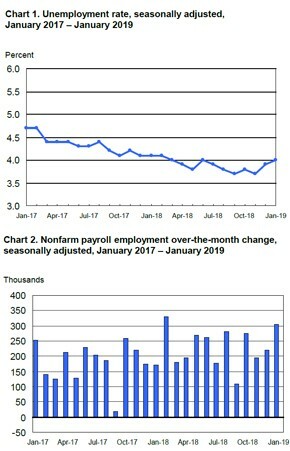 The first month of 2019 picked up where 2018 left off in terms of job growth in the U.S., with the number of nonfarm payroll jobs added by American businesses surpassing the strong figure seen last December: Per data from the Bureau of Labor Statistics’ latest Employment Situation Summary, U.S. organizations brought on 304,000 new workers in January. CNBC reported that a Dow Jones survey of economic experts initially expected about 170,000 jobs added. While this is slightly below the total of 312,000 originally reported for December 2018, the newest report revised that month’s gains down to 222,000 and brought November’s comparatively modest figure of 170,000 up to 190,000. Although the unemployment rate rose marginally between December and January – from 3.9 to 4 percent – this was attributed to a surge in the number of Americans actively looking for work, rather than any troublesome trend. Additionally, the partial shutdown of the U.S. federal government turned out to not affect overall employment to any statistically significant degree – beyond an 11 percent jump in the number of underemployed persons (those working part-time out of economic necessity). With that said, it’s worth noting that the BLS considered those who worked without pay or had been furloughed during the shutdown to have been fully employed, because their last paycheck came January 12, 2019, which was within the survey week for the report. As such, any full accounting of the shutdown’s economic effects (or lack thereof) on the economy remains unknown, and there is still the potential for another shutdown in a few weeks, considering that the bill to reopen the government only included appropriations lasting until February 15. There were a few less positive indicators found within the latest BLS report. Wage growth, for example, was somewhat slower than expected, with a 3 cent increase in the average American hourly wage representing growth of just 0.1 percent – under the 0.3 percent predicted by various economists. On a year-over-year basis, earnings have grown 3.2 percent between January 2018 and 2019. Some business leaders may also find themselves perturbed by the sudden switch to a cautious stance by the Federal Reserve, characterized by Fed Chair Jerome Powell’s January 31 statement that the central bank would not raise its key interest rate to start the year. According to NPR, Powell cited factors including the impending upheaval of Brexit and various trade disputes around the globe – including the arguments between the U.S. and China – as motivations for the Fed’s decision. Regardless of the Fed’s position, the economic picture for the U.S. at the start of the new year is undoubtedly positive.